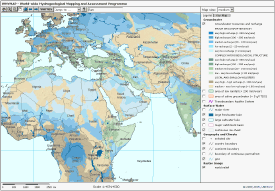 " UNESCO is publishing the first-ever world map of shared aquifers to coincide with the submission to the General Assembly of the United Nations on 27 October of a draft Convention on Transboundary Aquifers. Almost 96% of the planet’s freshwater resources are to be found in underground aquifers, most of which straddle national boundaries. espite its strategic importance, no global inventory of this resource had been compiled to date. Since 2000, UNESCO’s International Hydrological Programme (IHP) has been participating in the establishment of a groundwater database. It is now presenting a detailed map of transboundary aquifers ? available online ? showing the delineations of aquifers that are shared by at least two countries. It also provides information about the quality of their water and rate of replenishment. So far, the inventory comprises 273 shared aquifers: 68 are on the American continent, 38 in Africa, 65 in eastern Europe, 90 in western Europe and 12 in Asia. 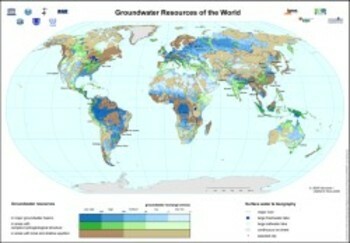 Groundwater resources of the world and their use [PDF 10 MB] "